Exercise 2.4: Is Appropriation appropriate? This exercises focuses on mapping systems, linking this with appropriation as in using Google Street View. I’ve considered Appropriation in other Modules – looking at the work of Eric Kessels and Joachim Schmid who are collectors of vernacular photography and create new narratives. The Project leading to this exercise concerns mapping and Google Street View. I also looked at Doug Rickard’s work using Google Street View to locate American street scenes which he then re-photographed from his computer screen, ‘freeing the image from its technological origins and re-presenting them on a new documentary plane. Mishka Henner has also made much use of Google to comment on ‘hidden’ activities. In his 2012 article Geoff Dyer recorded how Google Street View was inspiring new photography and the positive/negative reactions to the work of Michael Wolf and his discovery of ‘Unfortunate Events’ http://photomichaelwolf.com/#asoue/5 . Interesting as well that Jon Rafman used the same source material in some of his work – ‘photographs that no one took and memories that no one has’. Re Rafman, “One gets the impression not simply that he lack’s Wolf’s formation as an old-school photographer but that he has, quite possibly, never set food outdoors, that his knowledge of the world derives entirely from representations of it”. An interesting thought and I have to confess that I have often wondered how much time is spent at the computer screen and ‘stretching’ the concept of photography. I accessed a later article about Rafman and it seems he has moved away from Google Street View in a context where the extent of government and corporate surveillance is being challenged, “…any by increasing evidence that the profits of the digital revolution have mostly accrued to a tiny (mostly white, mostly male) class of entrepreneurs” . Rafman has apparently moved more towards marginal web communities and subcultures. – blending images sourced from them . He has a Second Life avatar (as do I actually although I haven’t visited in months now). The WeAreOCA 2013 article is archived and I couldn’t find the content, only a cartoon and the list of comments. The article seemed to be about artists accrediting assistants who had done the work for them and, of course, copyright issues. Google are quite happy about using their maps etc so long as you use proper attribution something I have done in the past when I’ve used them. I think Streetview maps can be very useful in giving an overview, although I have seen much more creative and personalised use of maps and diagrams. I’m interested in other forms of ‘mapping’ and recording journeys and I’ll write more on that when discussing context for Assignment 2. Liz Nicol’s work is on my list, particularly as I’m interested in cyanotypes as well. I’m also putting this here now so I don’t forget it. Another type of appropriation by the artist Susan Stockwell whose work I saw on a recent visit to The London art Fair . 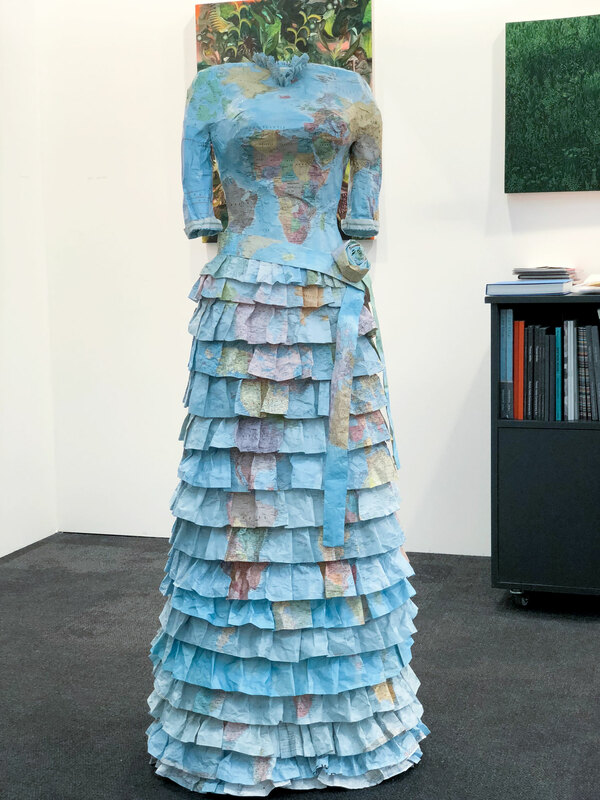 Susan Stockwell Her series, Dress Sculptures are made from maps and money – the maps defining and claiming the female body as territory. She also contributed work towards a 2010 Exhibition Who’s Map is It. Stockwell’s work River of Blood was created from laser cut vinyl and based on road maps of East London formed into the shape of the Thames, “The title references the bodily blood red arteries and a quote by Winston Churchill were he referred to the River Thames as the ‘silver artery of the Empire’.” The work evolved from a cut-out bus map of South London, Red Road Arteries. There many different ways of using maps and I’ll write more on this when discussing more specific preparation for Assignment 2. This entry was posted in Part 2 on January 18, 2019 by Catherine. Interesting work, Catherine. I used the work of David Thomas Smith as inspiration for my Anthropocene Devon section of the autobiographical work I did for assignment 5 of my DI&C module (www.lightrider.biz) It was great fun and, as you say, Google were very quick to respond to my request for their ok to print my work and publicise it. I remembered you telling me about that Anna, which is why added it to my resource file. Yesterday when I was photographing my hands and phone against the hand of artist Michael Snow at the Tate (see IG) I thought, stealing? appropriation? or collaboration? Like so much, all very fluid nowadays. I agree – it’s fluid, easy and, so, tempting. I’m wondering if I’ve reached the stage now where I try to avoid it. Very interested to see where the mapping aspect leads you. The dress you posted reminds me of https://www.bbc.co.uk/news/av/uk-22345932/wedding-dress-made-of-divorce-papers-for-gcse-project, which was created by a pupil at my daughter’s school. As soon as I saw the ‘sculpture’ I said to myself, “Woman of the World”. Reading the context of Stockwell’s work certainly added more depth. Just writing this made me remember Ray Bradbury’s “Illustrated Man”. Thanks for giving me that link – a very talented 15 year old who should go far.